Rochester is a city founded in 1854 in the U.S. State of Minnesota and is the county seat of Olmsted County located on the Zumbro River's south fork in Southeast Minnesota. It is Minnesota's third-largest city and the largest city located outside the Minneapolis-St. Paul Metropolitan Statistical Area. As of 2015, the Rochester metropolitan area has a population of 215,884. According to the 2010 United States Census the city has a population of 106,769. The U.S. Census Bureau estimated that the 2017 population was 115,733. It is the home of the Mayo Clinic and an IBM facility, formerly one of the company's largest. The city has long been rated as one of the best places to live in the United States by multiple publications such as Money. On August 21, 1883, the Great Tornado demolished much of Rochester, leaving 37 dead and approximately 200 injured. As there was no medical facility in the immediate area at the time, Dr. Mayo and his two sons worked together to care for the wounded. Donations of US$60,000 (US$1,567,054 in 2016 accounting for inflation) were collected and the Sisters of St. Francis, assisted by Mayo, opened a new facility named St. Marys Hospital in 1889. The Mayo practice grew and is today among the largest and most well-respected medical facilities in the world. Many notable people from around the world, including former Presidents Franklin D. Roosevelt, Harry S. Truman, George H. W. Bush, Gerald Ford, and Ronald Reagan, have visited Rochester as patients of the Mayo Clinic. Rochester has also been hit by two F4 tornadoes since 1950 (the first on May 10, 1953, and the other on September 16, 1962). Rochester lies alongside the South Fork of the Zumbro River which is 57.6 miles long and is ringed by gentle hills and largely surrounded by farmland within a deciduous forest biome. The Zumbro Watershed flows through 1,422 square miles of agricultural and urban lands. Located in southeast Minnesota, the City of Rochester falls within the Driftless Area: the only region in North America that was never glaciated and contains deeply-carved river valleys. The rugged terrain is due both to the lack of glacial deposits, or drift, and to the incision of the upper Mississippi River and its tributaries into bedrock. According to the United States Census Bureau, the city has a total area of 54.75 square miles (141.80 km2), of which 54.59 square miles (141.39 km2) of it is land and 0.16 square miles (0.41 km2) is water. 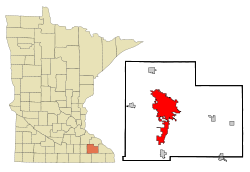 The city is located 85 miles (137 km) southeast of Minneapolis-St. Paul. As of the 2011–2015 American Community Survey, the median household income was $68,023. Rochester is governed by a mayor-council government with a seven-member city council. The current mayor is Kim Norton. As of January 2019, the city council comprises: Randy Staver, City Council President; Patrick Keane, 1st Ward; Michael Wojcik, 2nd Ward; Nick Campion, 3rd Ward; Mark Bilderback, 4th Ward; Shaun Palmer, 5th Ward; and Annalissa Johnson, 6th Ward. Rochester is the seat of Olmsted County, run by a seven-member elected county board, each representing district residents. The County Board of Commissioners oversee county operations and address citizen concerns. When a commissioner is elected, they are elected to serve a 4-year term. When that term ends, the commissioner can run for re-election if they so desire. The County Attorney and the County Sheriff are also elected to 4-year terms and can run for re-election when the term expires if they choose. Each of these elected officials acts as the director for his/her office, and are accountable to the residents of Olmsted County. 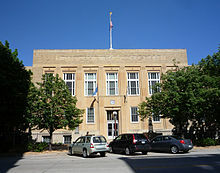 Rochester falls under the Olmsted County District Court within the Third Judicial District of the State of Minnesota. The city includes parts of Minnesota state legislative districts 25 and 26. In the Minnesota House of Representatives, District 25A is represented by Duane Quam (R), District 25B is represented by Duane Sauke (DFL), District 26A is represented by Tina Liebling (DFL), and District 26B is represented by Nels Pierson (R). In the Minnesota Senate, Rochester is represented by Dave Senjem and Carla Nelson, both Republicans. Rochester is located in Minnesota's 1st congressional district, represented by Jim Hagedorn, a member of the Republican Party. Rochester Public Schools enroll 16,300 students in 23 public primary and secondary schools. The city is divided into three public high school attendance zones: John Marshall, Mayo and Century. Private schools in the city include Lourdes, Schaeffer Academy, and Rochester Central Lutheran School amongst various smaller private religious schools. Studio Academy, a fine arts-focused charter school operated for 10 years in Rochester and closed its doors in 2011 upon losing its charter. The Rochester STEM Academy opened in 2011, occupying the former Studio Academy building. Higher education in Rochester had been concentrated around the former University Center Rochester in the city's southeast outskirts, where Rochester Community and Technical College shares a campus with a branch of Winona State University. The University of Minnesota offered degrees through UCR until 2007, when the University of Minnesota Rochester was established downtown finally establishing the presence of major university in the city somewhat in hand with the development comprehensive city planning and investment under the Destination Medical Center project. Rochester is also home to branches of Cardinal Stritch University and the Minnesota School of Business. Branches of Augsburg University and College of St. Scholastica are also in Rochester, as are branches of Winona State University and St. Mary's University. The Mayo Clinic offers graduate medical education and research programs through the Mayo Clinic School of Medicine, Mayo Clinic Graduate School of Biomedical Sciences, and the Mayo Clinic School of Health Sciences. According to the United States Census Bureau 2011–2015, the number of high school graduate or higher, percent of persons age 25 years+ was 94.1%. The number of bachelor's degree or higher percent of persons age 25+ was 41.3%. Mayo Clinic forms the core of Rochester's economy. As of 2016, it employs 34,180 people and draws more than 2 million visitors annually. The clinic's many facilities, along with hotels, restaurants and retail stores, comprise nearly all of the city's downtown. Excluding the state government, Mayo Clinic is the largest employer in Minnesota. Other care providers, including the Rochester Federal Medical Center, are significant employers. IBM's Rochester campus is one of the company's most important R&D and manufacturing centers. It has produced the System i series, been home to the first Blue Gene prototype, and contributed the servers for Roadrunner. Seven employees at the Rochester IBM campus created IBM Employees Credit Union, which is now Think Mutual Bank, a chain of banks in the Rochester and Twin Cities metropolitan areas. In 2013, Governor Mark Dayton signed a bill known as Destination Medical Center (DMC). It will also increase Mayo Clinic's tax base, business and economic growth throughout the state of Minnesota. Because of this legislation, The Mayo Clinic will invest in $3.5 billion to upgrade patient rooms, add additional work space, and build research and administrative buildings. The main developments of this plan will be in the DMC sub-districts. The Downtown Waterfront district will cover The Government Center, The Civic Center, and most areas near the Zumbro River. The Central Station district includes Central Park and most of Civic Center Drive, aimed to become a transportation hub of the city. St. Marys Place will cover St. Marys hospital and St. Marys Park, as well as most of 2nd Street. The Heart of the City will feature the Mayo Clinic campus and major residential, commercial, and retail companies. The Discovery Square area will include scientific and technology research facilities. Lastly, The UMR and Recreation district will feature Soldier's Field and the University of Minnesota Rochester campus. A number of Rochester buildings are on the National Register of Historic Places, including the historic Chateau Theatre, which in 2015 was bought by the city for preservation, and Avalon Music, formerly a hotel important in the local civil rights movement. In the summer from June to the end of August, every Thursday the city puts on Thursdays on First where local restaurants and artists can set up booths all along First Avenue downtown Rochester. There are two stages where bands perform and provide entertainment. There are also a number of street musicians sitting on walls or standing on the sidewalks. Minnesota has one of the most extensive state park systems in the nation. Seventy-two state parks are used year-round for hunting, camping, and hiking. In addition, Minnesota has more miles of bike trails than any other state, and a growing network of hiking trails. Likewise, Rochester's city park system is large, with more than 100 sites covering 5 square miles (13 km2). The city also maintains 85 miles (137 km) of paved trails in addition to state trails such as the Douglas State Trail. The nearest state park is Whitewater State Park. In addition, Rochester has provided educational and recreation opportunities through Quarry Hill Nature Center, a cooperative effort between the Rochester Parks & Recreation Department, Rochester Public School District and Friends of Quarry Hill Nature Center. Quarry Hill Park was originally a part of the former Rochester State Hospital farm and was purchased from the state by the City of Rochester in 1965. The Nature Center opened in 1973 as a cooperative effort between the Rochester Park Department and the Rochester Public School District. In September 1990, work was completed on a major addition to the existing nature center, effectively tripling the main floor area and enabling Quarry Hill to meet the increasing needs of both the general public and school. Additional facilities were completed in 2017 in addition to nordic skiing trails in 2014. These facilities include new educational facilities and a 19th-century prairie style home while guests can rent skis and snow shoes on site to enjoy the trails in winter. Oxbow Park and Zollman Zoo located on the Zumbro River in nearby Byron, Minnesota, offers hiking, camping, fishing, and extensive trails in addition to the Zollman Zoo which houses over 30 species of animals, most of which have injuries that would prevent them from surviving in the wild. All of the animals are native to Minnesota. The zoo is named after Dr. Paul E. Zollman. The most popular animals include a wolf, bald eagle, white-tailed deer, coyotes, bobcat, river otters, bison and a cougar. The zoo is open year-round. The city also maintains four public golf courses: Northern Hills, Eastwood Golf Club, Hadley Creek (9 holes), and Soldiers Field Golf Course located downtown. In addition, a number of private courses are located in the Rochester area, including Willow Creek Golf Club, Oak Summit Golf Club, Maple Valley Golf Club, Somerby Golf Club, and the Rochester Golf and Country Club along with a number of courses in smaller surrounding communities. Minnesota has one of the highest number of golf courses per capita in the country, generally found to be of much higher quality than public courses located in the Northeast and elsewhere. Extensive fishing is available in the area, including high quality trout runs. The city newspaper is the Post-Bulletin, an afternoon paper which publishes Monday through Saturday. The Post-Bulletin company also publishes Rochester Magazine, a monthly features periodical. There are three television stations based in Rochester: KTTC channel 10.1 (NBC), KTTC-(CW) channel 10.2, and KXLT-TV channel 47 (Fox) are a duopoly. The stations share studios as part of a special agreement between Quincy Newspapers and Segamorehill Broadcasting. ABC affiliate KAAL is also based in southwest Rochester. KIMT channel 3 (CBS) in Mason City, Iowa, channel 15 KSMQ (PBS) in Austin and channel 24 KYIN (PBS) in Mason City are among the stations that serve the market. KAAL is licensed to Austin, but has a studio in Rochester. Rochester is served by three U.S. highways (U.S. 14, U.S. 52, and U.S. 63), and the southern edge of Rochester is skirted by Interstate Highway 90 and State Highway 30. Olmsted County Highway 22 is also a main highway in the city because it circles most of Rochester. A combination of skyways and subterranean walkways, subways, link most downtown buildings, which residents often use to avoid harsh winter weather conditions. Public bus transit is run by Rochester Public Transit. Its operations are carried out by First Transit. The city had long been a fixture on Money magazine's "Best Places to Live" index, and was ranked number 67 on the 2006 list, and in the top 3, including number one multiple times, from 1993 to 1997. Faruque, Cathleen Jo. "Migration of Hmong to Rochester, Minnesota: Life in the Midwest" (Archive). In: Hmong Studies Journal; 2003. 50 pages.